Learn to tune a piano aurally, what follows is the standard protocole. First of all, you will need some basic tools, these you can buy at any online tool suppliers on the internet. 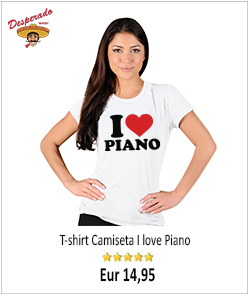 You could buy everything as a piano tuning kit or you can buy them individually. What ever way you choose, make sur e you buy the right tools. 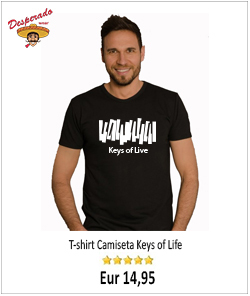 If possible try to buy good quality piano tuning equipment, that way you will have better overage results and your tuning will be easier and more accurate. Any metronome will do, but one of those small digital ones would be perfect. A metronome will be very handy in early learning so that we can practice and check the accuracy of the beat rates we use when tuning a piano. When we are accustomed to hearing and recognizing the beat rates, then will not need the metronome anymore. The temperament could be defined as a group of notes in the center of the keyboard, stretching appro ximately one octave (normally from F33 to F45 or from F33 to A49) that are tuned in a certain way. Once the temperament is set we will use it as a reference to tune the rest of the keyboard. 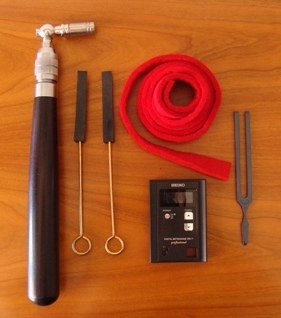 Setting the temperament is the most important aspect of tuning. 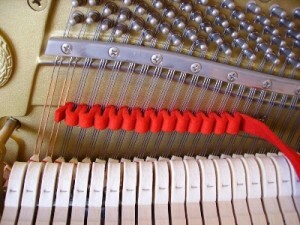 The quality of our piano tuning depends a great deal on how well the temperament has been built. Although setting the temperament is not really complex, its study required some time and practice. Time well spent I would say, as once learned, you can apply to every tuning you will make in future. The “stretch” is tuned exponentially, that means that the stretching becomes more and more pronounced as you advance up the keyboard There are theoretical tables that allegedly determined the amount of “stretch” for every key, but that’s all. In this matter like in many others involving piano tuning there is not rule of thumb, and in reality every tuner do the “stretch” at his/her discretion. I think, to be precise, when in the lower notes the stretch shouldn’t be call that way, but the “shrink”, as that’s what really happens. To do the “stretch” you will need some practice and experience. If you are newbie to piano tuning I don’t recommend you try doing the stretch, at least not for now. Just wait some time till you are reasonably proficient. You are welcome. 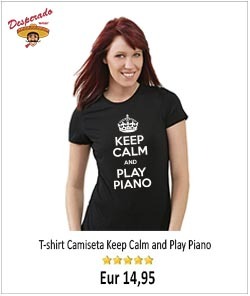 I am sure that providing you follow the necessary steps and put into it a bit of time and patience you will soon be able to tune your piano, or at least to better it significantly. We are here to help. Is there a different way of tuning the ‘stretch’ for a piano that is used to accompany other instruments or even choirs? I wonder about how a woodwind instrument (for example) can stay in tune with a stretched piano. Could this be partially why singers can seem to be flat on high notes? Maybe it’s really the piano that’s a touch sharp, but it sounds better. The stretch is done automatically when you tune octaves so they sound good. The range of the piano is much more than the voice or woodwinds, so they do not seem as out of tune with the stretch. The more important difference is equal temperament. The piano in equal temperament, has beating Major 3rds. The voice and woodwinds will alter pitch on the fly to reduce those beats considerably, producing pure of close to pure thirds. This is referred to as Intonation. Hi Juan, thank you so much for putting this info in the internet. I have a baby grand piano, my kid plays piano, but I didn’t . I would like to try to tune my piano by myself. Could you explain for third and sixths interval ? what do you mean about the temperament ? fast beat easier to judge ? could you explain more how to recognize, because I don’t have a basic of music knowledge. Welcome to the blog. I´ll try to answer your question. The so call “temperament” is a group of notes expanding about an octave that are tuned in a precise manner. Once we have created the temperament, we just “copy” or better said, use as a reference to tune the rest of the keyboard. To tune the temperament we use sixths and thirds intervals, for example if you press middle C and E at the same time that is a third interval, if you press middle C and A that is a sixth interval. This seems mostly backwards – tuning ‘just’ intervals is generally more successful, and temperament lowers the higher intervals and raises the lower range. Am I totally off here, or is the writer? Could be the writer, as my mother tongue is not English but Spanish, but not in this case. What your are reading in the article (Piano tuning procedure) is a simple introductory tutorial about the piano tuning protocol. It’s purpose is not to teach you to tune a piano (obviously imposible in a short entry) but to give you a basic idea. The full tuning procedure with the tuning beats (mp3 files) to set the temperament and specific instructions are in the book: “How to tune a piano“. Just intervals don’t line up in all keys. Excellent video, congratulations!. Highly recommend for everyone interested in this topic. Thank you so much, lets keep in touch. How does one set the temperament? Down a fourth, up a fifth? how many beats sharp, flat? The temperament that uses fourth and fifth intervals is the old fashion temperament, nowdays outdated by the better and more accurate temperament that uses mainly thirds and sixths intervals, and only fourth and fifths just for testing.